Vol. 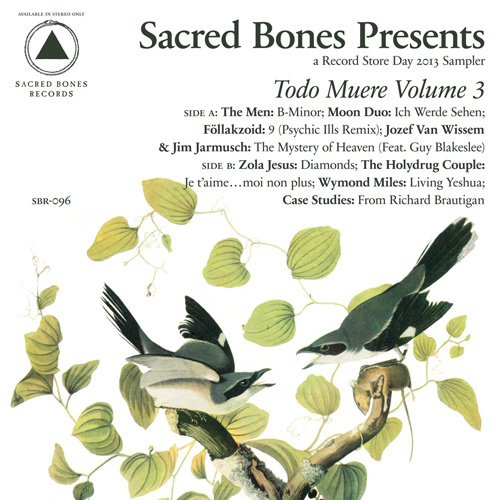 3 of Todo Muere features a slew of unreleased material. Side A is a bonus song from The Men’s New Moon sessions, a German version of Moon Duo’s “I Can See”, a Psychic Ills remix of a Föllakzoid’s “9” and an updated version of Jozef Van Wissem & Jim Jarmusch’s title track, featuring vocals by Guy Blakslee of Entrance Band. Side B contains Zola Jesus’s cover of “Diamonds” by Rhianna, The Holydrug Couple covering Serge Gainsbourg, and previously unreleased demos from Wymond Miles and Case Studies (both of whom have full lengths out now).